Arizona topo maps are a must have if you enjoy backpacking, hiking, biking, hunting, or any outdoors activity that allows you to enjoy the diverse expanse of this State. Arizona, the Grand Canyon State, is a large plateau on the north, that consists of large, dry canyons, and a gorge that is approximately two hundred miles long, and at it’s widest point, eighteen miles wide. Inside this immense region is Humphrey’s Peak, which is the tallest of the Arizona peaks, the Painted Desert, and the Petrified Forest. Separating the northern plateau from the central region of the State is the Mogollon Rim. Almost two hundred miles long, this rim is mostly characterized by high cliffs made up of limestone and sandstone. In the southeast are the Mexican Highlands, a basin that is two hundred thirty-five feet below the Salton Sea. The Sonora Desert in the southwest. This desert is one of the largest, and hottest in North America. It covers a land mass of 120,000 square miles. The largest river in Arizona is the Colorado River. This river flows southwest from the Glen Canyon Dam at the border of Utah, then flows west through the Grand Canyon to Hoover Dam, then flows south where it then forms the borders of Nevada and California. Although Arizona is characterized as a desert, it has a vast amount of mesa’s and mountains. Which is why traveling through this State’s backcountry is often a rigorous and dangerous journey, and why Arizona topo's are a crucial point to ones survival gear. There are so many types of topos that the enormity of the choices can actually end up confusing the consumer looking to buy a topo. However, because of all those choices of maps to chose from, the quality of those maps have increased greatly over the years. Although their have been many new map producers entering the market, I believe the best topos are still being produced by the long standing companies like Garmin, DeLorme, and National Geographic. 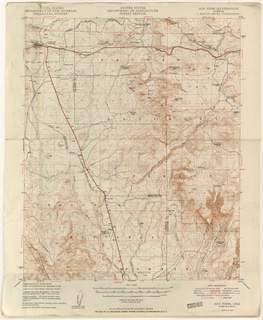 Whether you are looking for Arizona maps that are either a software, or a hard product like the Gazetteer, I’m sure you will be surprised at the variety and the features of the many maps that are listed below. Visit here for more information about topography. Have You Tried Metal Detecting? We us Arizona topo maps to locate these areas.